Here we are in the midst of Celebrity Blogger Fortnight Week. 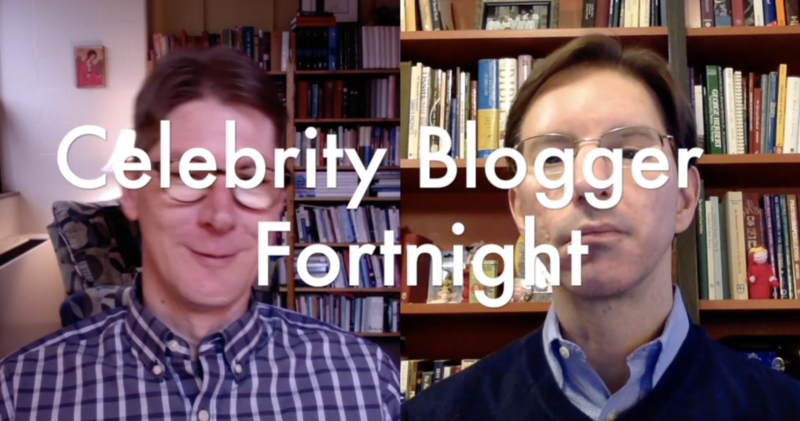 In this week’s edition of Monday Madness, Tim and Scott welcome our three newest Celebrity Bloggers and give some advice on how to act when you meet one of your favorite Lenten personalities in person. Autographs are fine but show some decorum, people! Don’t be labeled a Lentarazzi. Of course, it wouldn’t be Monday Madness if we didn’t urge you to stock up on Saintly Scorecards (single, bulk, or Kindle) and Giant Bracket Posters. In fact, why not head over to the Lentorium for all your Lenten tschotske needs? Despite your denials, Lent is just around the corner! Have you followed Lent Madness on Twitter? Have you liked Lent Madness on Facebook? Remember, if we don’t get to 20,000 likes on Facebook, a Lent Shutdown is almost certain. Tell everyone you know to like Lent Madness on Facebook. We have over 500 new likes since last week, but we still need about 1,600 to reach the goal. This is here for social media sharing. Never mind. 9 Comments to "Monday Madness — Celebrity Blogger “Week” Edition"
I have converted the Presbyterian Pastor I work for to Lent Madness. He asked why I didn’t have my bracket up last week. I explained I was planning to wait until February but he insisted I post it and have extras printed out for people to pick up for their personal use. Now I talked him into ordering a Saintly Scorecard! My church is into the brackets!! Everyone is getting their book and we have the big poster ready to go. Helps that many are sports nuts. If there’s a Lent Shutdown, does that mean I don’t have to give up anything? I think it DOES mean we don’t have to give up anything. We can eat all the chocolate we want. No bunny ears will be safe from us…nibble…nibble…nibble. Received the Scorecards and the large poster today — ordered less than a week ago!!! Now all I have to do is figure out where to hang one in the Sunday School Wing and one for the Parish Hall. Dear, sweet goyim that you are … it’s “tchotchke.” No ‘s’ unless it’s plural! You guys crack me up!! Posters purchased, scorecards at the ready, congregation wondering if I’ve lost my mind…we are all set!!! Pleease don’t shut down this Madness! I’ve only just found you! This is our first year, all booklets and bracket ready. We truly need this boost of faith and fun as we have had sad times recently. Pleease!!! I love the bulletin insert! Do you have a grayscale version that doesn’t turn the saints into blobs of black ink. My church doesn’t have a color printer?